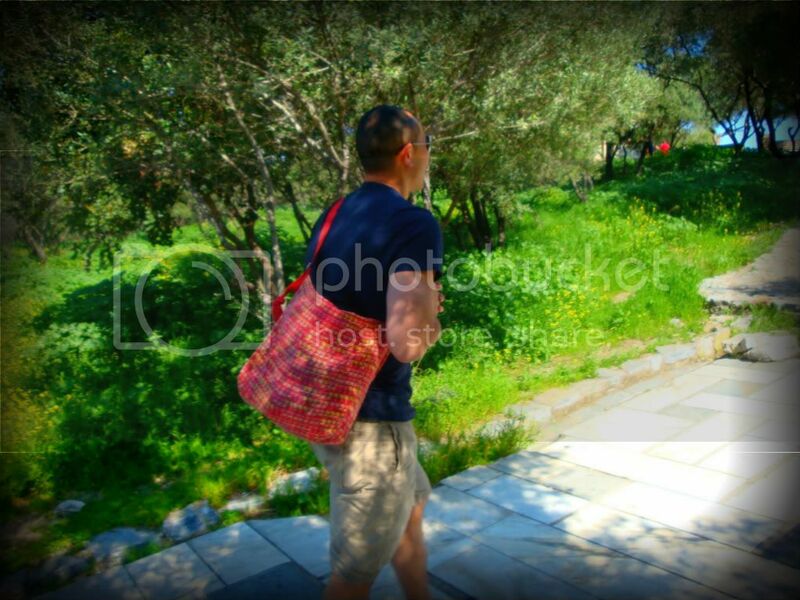 We did some crazy walking in Athens. That's because there is so much to see and do there. I showed you most of the highlights in my last post, but there's still some important things to share with you. Like how if you don't make it across the crosswalk before the oncoming traffic has a green light, the motorists accelerate and aim for you. Seriously, the minute the little man turns red you better be sprinting for your life to the other side. It's also important for you to know how amazing the fresh pressed orange juice is there. 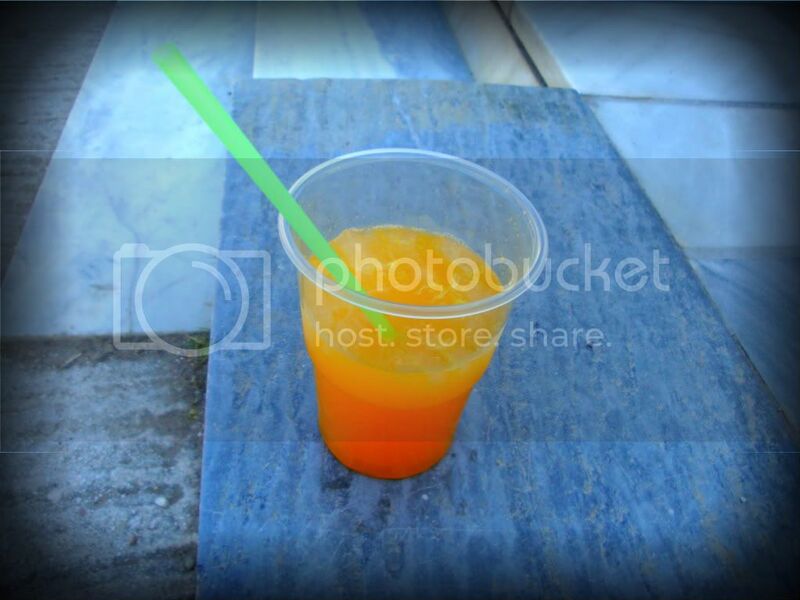 While Luis was purchasing our tickets for the Acropolis, I wandered over and purchased a big ol' glass of fresh pressed orange juice over ice. I could not get enough of it. Our hotel had a juicer as well allowing me to indulge in fresh pressed orange juice both mornings that we were there. And while we are on the subject of tasty things Athens has to offer, let's not forget the Greek yogurt, also available at breakfast each morning as well as this awesome little yogurt shop, Fresko. This is the good stuff right here. So rich and creamy with a variety of delicious toppings to choose from. Also on our list of things to eat: kebap, which we enjoyed at Thanasis near Monastiraki Square. It's pretty touristy, but a local girl, who my sweet friend Stephanie connected us with recommended it as one of the best, and one locals head to for their kebap fix. And she was right because we did try a couple other spots and we kept coming back to this one. Yes we ate there multiple times. The pita bread there was sooooo good. Luis loved the kebap. I promise you, this is the start of his "this is unbelievably amazing" face. Thanasis also provided great entertainment as the manager was quite the character. He's the one who was spraying the kids with water for begging outside his restaurant. He also grabbed my camera from the table and pretended like he dropped it but, unbeknownst to me as I watched my camera free falling downward, he had the string in his hand so once it hit the string's end it stopped. Not sure if any of that made sense, but basically, outside of giving us, okay mostly me a scare followed by a laugh, he was just being nice and gonna take our picture for us. While trying the local food is a major highlight for us when we are traveling, we do check out the historical sites in between meals. We checked out the Panathainaiko Stadium, the site of the first modern Olympic games in 1896. The stadium is constructed completely out of white marble and used to hold a surprising 80,000 spectators. Today, it seats closer to 45,000...not sure why the difference there but Wikipedia says it so it must be so. The audio guide provided upon entrance into the stadium was interesting and informative. It was fun to walk through as the guide explained different aspects of the stadium, taking you back to key moments in the history of the stadium. The seating is really steep and some of the steps are quite high. I struggled to get up some of them. The track was built up higher than the walkway between the seats and the track so that when people were walking by they wouldn't block anyone's view of the race. This picture shows the original drainage system of the stadium, which allows all the water to flow underneath the stadium, and still functions to this day. Another highlight of the stadium was the full on sunshine that we could just sit and enjoy as we listened and learned. And of course, who can resist taking a picture on the winners' podium. On the side they had a list of all the Olympic games and where they were held since 1896. It was written in Greek and we had fun trying to decipher each of them. Here you can see, Tokyo is pretty obvious, but Los Angeles, which is second from the bottom isn't quite as recognizable. Our hotel was right by Syntagma Square, which is where the Hellenic Parliament is located. We just happened to go to the parliament at the exact time of the changing of the guard. We took lots of pictures of this, and actually, now that I think about it, I should have taken a video. I did not even think of that when we were watching this and I totally should have because a video would be way better. The photos will have to do. Play the slideshow for the comical ritual of the Greek changing of the guard. We just want to know, who choreographed all those steps? Who said they had to raise their leg, swing it back, swing it forward again, making sure that their shoe drags on the ground on each swing? And the outfits? I don't even know where to begin with those. The dudes going on duty looked like they were new because that Army looking guy was watching this all take place and calling out to them at times throughout. Then he went and repositioned them as they stood, which you can see in the last pictures. And to wrap up our trip, here are just a few random shots of a variety of different things. A well articulated political sign. Please say you caught my sarcasm in the well articulated comment. Free beer, free Siemens TV, fridge, washing machine...now that would be an interesting campaign strategy. Can I just take a moment and brag about my sweet husband? He carried my (surprisingly heavy) bag for me up the hill as I huffed and puffed my way up. Ladies, get yourself a man whose love for you overcomes his manly aversions to carrying a purse. This next shot is a common site in Europe. A beautiful, old church, dressed up like a circus tent. While I love all the old style buildings of Europe, unfortunately, because they are old, so many of them are undergoing restoration. This old building was hiding underneath a large, newer building which was apparently just built right over it. Churches like this one popped up amidst modern buildings throughout the city. Athens was madness. Chaos. So much going on. Old men playing street games, trying to win a little extra dough. And of course, being so close to the water, we couldn't not head down to the coast for a bit. So we hopped on the metro and took in the beautiful views of the Aegean Sea. We found this hip cafe overlooking the marina. They brought us FREE tap water, with ice, without us even asking for it. It was amazing. Why can't Germany get on the free water train? America gets it. France gets it. Greece gets it. Our last day in Athens happened to be the Greek Independence Day, in celebration of Greece rising up against Turkish rule. Given the current political unrest in Greece, there was concern that protests could turn violent so they posted up extra security and blocked off all access to Syntagma Square. This woman was shouting who knows what at the police. Nothing ended up happening, but they sure were ready if something did go down. And that concludes our trip to Athens. My conclusion on the city. Fun. Lively. Beautiful. A great blend of history and culture with a little bit of (good) craziness mixed in. Happy travels!